Netflow Auditor provides network and security teams the fastest and most scalable and granular flow-analytics solution available globally with superior and speedy contextual network traffic accounting reporting and alerting. Engineering excellence delivers to you unsurpassed collection, correlation, granular data retention and diagnostics that automatically extract deep intelligence from huge flow data to quickly detect threats, network misuse and malicious traffic categorizing and qualifying the seriousness of an anomalous network traffic event. 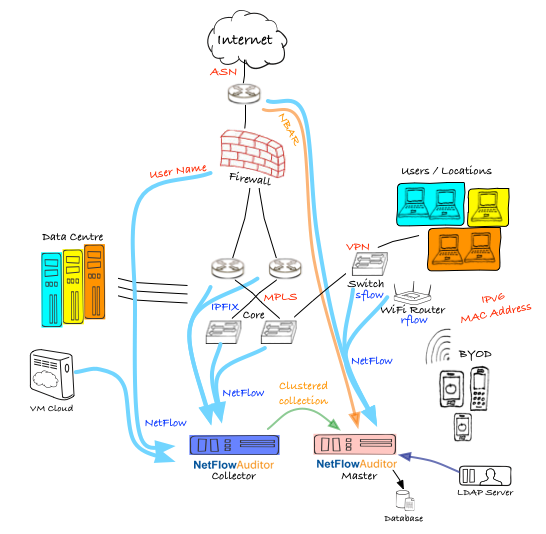 Using scalable collection of NetFlow, IPFIX and sFlow to monitor pervasively, Netflow Auditor’s unique granular forensics, anomaly detection, threat intelligence, performance and visual analytics eliminate network blindspots to discover and thwart cyber-attacks, DDoS, Ransomware, APT and Insider Threats with complete application performance, bandwidth, QoS and traffic accounting analytics enabling security and other network issues to be quickly identified accelerating incident response and reducing enterprise risk in even the most challenging environments. Thank you for your great and constant support. This application provides a lot of options but its still intuitive and easy. Thanks for checking on us - we're really appreciative! Your solution is definitely the most full featured one out there! A while ago, I was working for a bank and I was using your software. I would like to repeat the experience with my new company. One thing I do have to say, support is great! It is getting tougher these days to get this kind of support. Leverages the benefit of economical flow-based analytics substantially reducing costs to secure and manage a network. Provides flexible data mining and reporting tools for complete contextual Netflow forensics. Eliminates network blindspots enabling security and other network issues to be quickly identified. Massively scalable allowing clustered query across multiple NetFlow Auditor data-warehouses. Uniquely supports both collection and retention of millions of flows per second. Enables organizations of all sizes to monitor at various levels of granularity from simple visibility to full compliance. Completely eliminate network blindspots with granular insight and transparency into every transaction. High-granularity retention enables you to substantially reduce risk to discover ransomware, malware, p2p abuse and data leakage needles in the haystack. 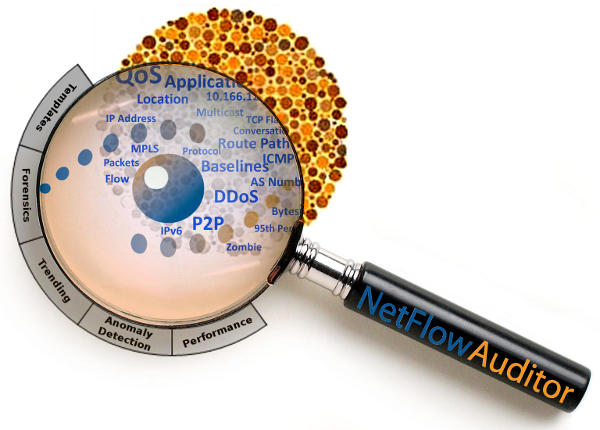 Netflow Auditor is the only tool in the flow market place that can provide this critical visibility. In-depth dynamic network baselining performs continual monitoring and benchmarking to identify problems with speed and accessibility, discovering outliers and detecting vulnerabilities and other problems within the network. Historical baseline analytics enable profiling of any aspect of the network and applications communications. 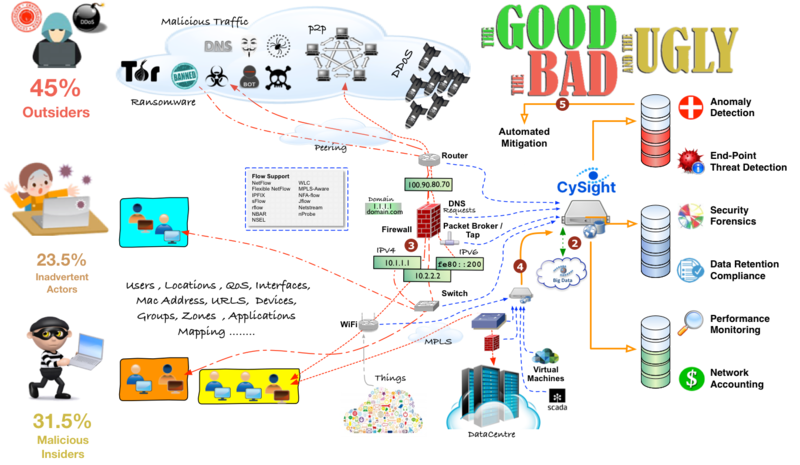 Discovers Cyber-Attacks using dynamic Machine-learning algorithms to provide early warning on DDoS, Anomolous traffic, Advanced Persistent Threats and Insider Threats. Monitors for communication with end-points of poor reputation. Correlates real-time traffic against global threat big-data substantially remediating and reducing risk. Netflow Auditor is an integrated cyber network intelligence solution delivering scalable, granular on-demand and actionable intelligence about everything traversing your network. Global threat intelligence big-data coupled with machine learning, anomaly detection and automated diagnostics leverages the benefit of economical flow-based analytics substantially reducing the cost of securing and managing a network. Uniqueness of approach begins at data capture with Netflow Auditor’s highly scalable collection, archival correlation and hierarchical methods that enable granular data retention from huge flow data streams or from hundreds of distributed physical or software defined networking devices. Granular retention provides the ability to extract deep intelligence enabling automated data-mining diagnostics to detect malicious traffic and repeat offenders and categorizes and qualifies the seriousness of an anomalous network traffic event. NetFlow Auditor constantly keeps its eyes on your Network and provides total visibility to quickly identify and alert on who is doing what, where, when, with whom and for how long. It learns network behaviors and detects and alerts on anomalies and finds hosts conversing with suspect ransomware, botnets, tor, illict sharing and more..
Netflow Auditor scales from largest to smallest networks in architecture and licensing and is therefore suitable for enterprises of any size. It is used by organizations of all sizes such as councils, utilities, banking, universities and all tiers of telcos and managed services. Multinationals, large corporates, ISPs, government, health care, finance houses, campuses and other large networking infrastructures will particularly appreciate our scaling ability. We look forward to you experiencing why we've made many other customer's lives very easy with our smart alerting and actionable intelligence and the scalable benefits only NetFlow Auditor can provide.